Streptococcus pneumoniae is the leading cause of community–acquired pneumonia in Africa. Antimicrobial resistance of S. pneumoniae to penicillin and other commonly used antibiotics has increased worldwide. However, prevalence data from the African region are sparse, especially with regard to adults. In this study, adult patients presenting at an urban referral hospital in central Mozambique were screened for pneumococcal pneumonia during an 8-week period in 2010: Patients with a respiratory syndrome underwent chest radiography and a sputum sample was collected for pneumococcal culture and antimicrobial susceptibility testing. A urine sample was tested for the presence of pneumococcal antigen. 177 patients with a respiratory syndrome were included. 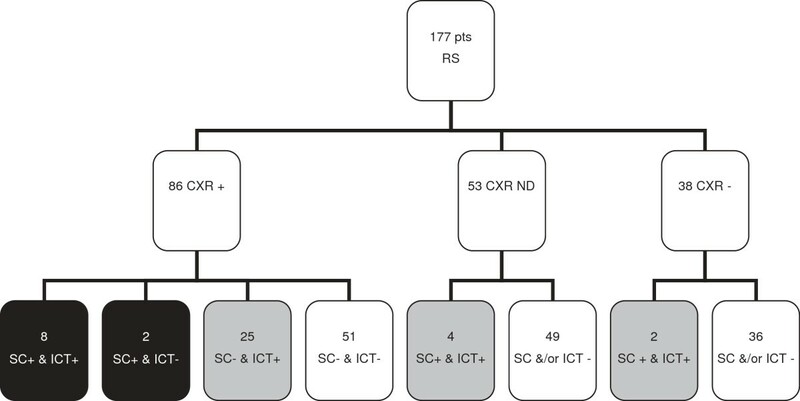 Overall, 41/177 (23%) patients fulfilled criteria for definite or probable pneumococcal pneumonia and in the group of patients with a positive chest x-ray this concerned 35/86 (41%) patients. 166 sputum cultures yielded 16 pneumococcal strains. One mg oxacillin disc testing identified potential penicillin resistance in 7/16 (44%) strains. Penicillin minimal inhibitory concentrations (MICs) were measured for 15 of these strains and ranged from <0.016-0.75 mg/L. No MICs >2 mg/L were found, but 3/15 (20%) pneumococcal strains had MICs >0.5 mg/L. All pneumococci were sensitive to erythromycin as measured by disc diffusion testing, whereas 44% was resistant to trimethoprim-sulfametoxazole. The proportion of pneumonia cases attributable to pneumococcus appeared to be high. Whilst none of the S. pneumoniae strains tested were penicillin resistant, standard penicillin dosing for pneumonia may be insufficient given the observed range of pneumococcal penicillin MICs. Streptococcus pneumoniae is the leading cause of community-acquired pneumonia around the world and in Africa . Severe pneumococcal disease, for which HIV is a major risk factor, is associated with a high mortality in African adults [2, 3]. Antimicrobial resistance of S. pneumoniae against the most commonly used antimicrobial drugs is increasing worldwide, principally affecting β-lactam, macrolide and sulfonamide sensitivity . In Africa, β-lactam antibiotics, and penicillin in particular, are amongst the most widely used antimicrobial drugs for empirical treatment of pneumonia. However, African antimicrobial resistance data are scarce, especially when concerning adults [5, 6]. We investigated the prevalence of penicillin resistance of S. pneumoniae in adults with pneumococcal pneumonia presenting in an urban hospital in central Mozambique. Our study was conducted at the Beira Central Hospital (Hospital Central da Beira: HCB), a 932-bed governmental referral health facility with 260 internal medicine beds, located in the coastal capital of the central Sofala province of the sub-Saharan African Mozambique. The HIV prevalence among adult women in this region was found to be 22.9% in 2009 . Mozambique also ranks amongst the countries with the highest tuberculosis burden, with an estimated 409 new cases per 100,000 pop/year. Pneumococcal vaccination of infants as part of the Mozambican National Immunization Programme only started in April 2013. We carried out a cross-sectional study among adults (≥ 16 years) presenting at the HCB emergency room with a respiratory syndrome. A respiratory syndrome was defined as fever (axillary body temperature ≥37.5°C) in combination with one or more of the following complaints: cough with or without sputum production, dyspnoea and chest pain. Study participants were recruited prospectively during a study period of 8 weeks, from April to June 2010. A posterior-anterior chest x-ray (CXR) was made immediately after presentation and subsequently digitalized for review by an experienced, external pulmonologist, who was blinded to the study participant’s clinical data and pneumococcal test results. Written informed consent was obtained from each patient before study entry. Ethical approval was obtained from the Mozambican National Committee of Bio-ethics, through its sub-committee seated in Beira (ref. : 007/10/SBCE). Sputum samples were collected from all patients for pneumococcal culture and sensitivity testing. Patients were carefully instructed about how to provide a good-quality sputum sample in a standardized way and study staff directly observed the sputum production process for all study participants. Sputum was inoculated on selective Columbia CNA sheep blood agar plates (bioMérieux SA, Marcy l’Etoile, France). Plates were incubated overnight at 35–37°C in a candle jar after placement of a 5 μg optochin disc (Oxoid Ltd., Cambridge, UK). Colonies suspected for pneumococcus, on the basis of colony morphology and optochin susceptibility as per manufacturer’s instructions, were subcultured on sheep blood agar plates (bioMérieux SA, Marcy l’Etoile, France). The Dryspot Pneumo latex agglutination test (Oxoid Ltd., Cambridge, UK) was used as per manufacturer’s instructions for final identification. Antimicrobial susceptibility of pneumococcal isolates against oxacillin (1 μg), trimethoprim-sulfamethoxazole (co-trimoxazole: 5.2-240 μg) and erythromycin (78 μg) was tested using disc diffusion method (Neo-Sensitabs, Rosco Diagnostica, Taastrup, Denmark). Zone diameter breakpoint interpretation was done according to European Committee on Antimicrobial Susceptibility Testing (EUCAST) recommendations as recommended by the manufacturer. The benzyl penicillin minimal inhibitory concentration (MIC) was measured using E-test strips (bioMérieux SA, Marcy l’Etoile, France). Clinical breakpoint interpretation of these MICs was done using the EUCAST clinical breakpoint tables for interpretation of MICs, using the recommendations for non-meningeal infections: MIC ≤ 0.06 mg/L: susceptible; > 2 mg/L: resistant; > 0.06 and ≤ 2 mg/L: intermediate category with dose specific breakpoints . A urine sample was collected from all patients for urinary pneumococcal antigen testing using Binax NOW S. pneumoniae, according to the manufacturer’s instructions (Binax Inc., Portland, ME, USA; currently manufactured by Alere Inc., Waltham, MA, USA). In the absence of a ‘gold standard’ definition of (suspected, pneumococcal) pneumonia and given the lack of state-of-the-art blood culture capacity at the study site, the following definitions were used. Suspected pneumonia was defined as a respiratory syndrome combined with a positive CXR, as defined by showing evidence of any consolidation, and/or pleural effusion, and/or interstitial disease. Definite pneumococcal pneumonia was defined as a respiratory syndrome in combination with a positive CXR and a positive sputum culture with S. pneumoniae. Probable pneumococcal pneumonia was defined as a respiratory syndrome in combination with a positive CXR and a positive ICT. In the absence of a CXR, or whenever a CXR was not positive, a respiratory syndrome with a positive sputum culture with S. pneumoniae AND a positive ICT was also defined as a probable pneumococcal pneumonia (Figure 1). Study profile. Pts: patients; RS: respiratory syndrome; CXR: chest x-ray; ICT: immunochromatographic test (urine pneumococcal antigen test); SC: pneumococcal sputum culture; +: positive; -: negative; ND: not done; Colour/pattern boxes: black: definite pneumococcal pneumonia; grey: probable pneumococcal pneumonia. Data were entered and analysed using the Epi Info package version 2002 (CDC, Atlanta, GA). 177 patients were screened. 97/177 (55%) patients were female and 150/177 (85%) patients were between 16–45 years. HIV status was known for 105/177 (59%) and in this group 84/105 (80%) patients were HIV positive. When asked about antibiotic use in the previous three months, 51/177 (29%) of patients was not able to answer this question because they were uninformed, physically unable to answer or because of a combination of the two. 48/177 (27%) of patients confirmed the use of antibiotics and another 78/177 (44%) denied its use. 30/177 (17%) of patients were receiving antibiotics at the time of study inclusion. Although the name ‘penicillin’ was often mentioned in this group (70%), it was not possible to verify this information in most cases. 13/177 (7%) of patients were found to be on TB treatment at study inclusion. 53/170 (31%) patients had a positive urinary antigen test. In 124 patients a CXR was done. 86/124 (69%) patients had a positive CXR and were therefore qualified as having suspected pneumonia. 35 of these 86 (41%) patients turned out to have pneumococcal pneumonia, based on a positive culture and/or a positive urinary antigen test. An additional 6 patients had a positive culture and a positive urinary antigen test in the absence of a positive CXR, so overall, 41/177 (23%) patients with a respiratory syndrome fulfilled the criteria of either definite or probable pneumococcal pneumonia (Figure 1). A total of 166 sputum samples were collected and subsequent culture yielded 16 pneumococcal strains (Table 1). One mg oxacillin disc testing identified potential penicillin resistance in 7/16 (44%) strains. One pneumococcal strain did not survive for further testing and as a result, MICs were measured for 15 pneumococcal strains using the E-test. Benzyl penicillin MICs ranged from <0.016 to 0.75 mg/L. No isolates were found to be resistant to penicillin (MIC >2.0 mg/L). However, 3/15 (20%) pneumococcal strains had MICs >0.5 mg/L, and would classify as non-susceptible when a dose of penicillin of 1.2 g (2 million IU) 4 times daily or less is used. Based on disc diffusion testing a 100% susceptibility rate was observed for erythromycin, whereas 7/13 (44%) strains were resistant to co-trimoxazole. Minimal inhibitory concentration (MIC) and zone diameter breakpoint interpretation (BI) of cultured pneumococcal strains, as measured by E-test (penicillin) and disc diffusion method (oxacillin, erythromycin, co-trimoxazole), respectively. S: susceptible; NS: non-susceptible; R: resistant. In pneumonia, when a dose of 1.2 g (2 million IU) × 4 is used, isolates with MIC ≤0.5 mg/L should be regarded as susceptible to benzyl penicillin; with a dose of 2.4 g × 4 or 1.3 g × 6, isolates with MIC ≤1 mg/L should be regarded as susceptible; and with a dose of 2.4 g × 6, isolates with MIC ≤2 mg/L should be regarded as susceptible . Not done: ND. Our study presents the first data concerning susceptibility to commonly used antibiotics in adult pneumococcal pneumonia in urban Mozambique. As expected, our study population mainly consisted of young adults with an estimated high HIV prevalence. With 41% of probable pneumonia patients diagnosed with pneumococcal pneumonia, the proportion of pneumonia attributable to pneumococcus was apparently high. All cultured pneumococcal strains were found to be penicillin susceptible, but 3/15 strains had penicillin MICs > 0.5 mg/L, for which dose specific clinical breakpoints apply, according to the EUCAST recommendations. The estimated high contribution of S. pneumoniae to the local burden of pneumonia as found in our study seems to match the results of etiological studies in Africa, where S. pneumoniae was the most common causative agent, being found in 31-46% of pneumonia cases [9–11]. After a critical appraisal of microbiological, pharmacokinetic and pharmacodynamic data, as well as clinical studies on the use of penicillin in non-meningeal pneumococcal infection, current penicillin MIC breakpoints for treatment of non-meningeal S. pneumoniae infections from the American Clinical and Laboratory Standards Institute (CLSI) have been expanded and re-set at ≤2 mg/L (susceptible) and ≥8 mg/L (resistant) in 2008 . In contrast, for pneumonia, EUCAST categorizes pneumococcal strains with MICs >2 mg/L as resistant while recommending dosage specific MIC breakpoints for strains with MICs ≤ 2 mg/L. EUCAST suggests for each country to apply the breakpoints appropriate for the dosage of benzyl penicillin most often used . As for adult benzyl penicillin treatment in Mozambique, the national formulary recommends the use of ‘1 million International Units (IU) or more, 4–6 times daily’ for non-meningeal infections . MICs as measured in our study do justify the continued use of penicillin in adult pneumococcal pneumonia in our setting. However, current EUCAST’s interpretation of clinical MIC breakpoints supports the use of a standard dosage that would be effective against all strains with penicillin MICs within the observed range, i.e. 2.4 g (4 million IU) 4 times daily or 1.2 g (2 million IU) 6 times daily (Table 1). Pneumococcal susceptibility rates appear to vary across Africa, but a comparison of data is complicated by the use of different antimicrobial susceptibility testing methods and interpretive criteria. In a recent systematic review on community acquired bloodstream infections in Africa, 9.7% (range 0-36%) of pneumococcal isolates was resistant to ampicillin, 40% to co-trimoxazole and 2% to erythromycin . South Africa, -one of Mozambique’s neighbouring countries-, reported the most impressive pneumococcal resistance rates in the region with 25-50% of isolates being resistant to penicillin (MIC >2 mg/L) . In contrast, in neighbouring Malawi, hospital surveillance data demonstrated that the rate of potential penicillin non-susceptibility based on disc diffusion testing in invasive pneumococcal strains has been approximately 10% since 2005, which appears to be lower than the rate found in our study . However, in this study, MICs were not determined. Co-trimoxazole resistance is common in Africa and our study results are not different in this respect . Our results have to be interpreted with caution as the pneumococcal culture sample size was small and a positive sputum culture may represent colonization rather than infection, although we believe that this risk is low as we selected patients on the basis of a clinical syndrome in combination with radiologic and microbiological criteria. In conclusion, the proportion of pneumonia attributable to pneumococcus was high in adults in an urban referral hospital in Mozambique. All pneumococcal strains turned out to be penicillin susceptible as based on benzyl penicillin MIC results and there seems to be no need to abandon penicillin as the main treatment for pneumococcal pneumonia. At the same time, given the presence of strains with MICs > 0.5 mg/L, current standard penicillin dosing for pneumonia may be insufficient. For Mozambique, as well as for other sub-Saharan African countries, we would like to emphasize the need for the use of a standard dosage that would be effective against strains with penicillin MICs within the locally observed range. More extensive, continued monitoring is needed to guide prudent empiric antibiotic choices. JCB and JMP are internists and infectious diseases specialists who have been collaborating extensively with the Faculty of Health Sciences of the Catholic University of Mozambique (UCM) in Beira and the Ministry of Health of the Republic of Mozambique (MISAU) since 2006 for the improvement and expansion of graduate and post-graduate internal medicine training, including infectious diseases. We thank the HCB Emergency Room medical and nursing staff for their collaboration and advice with regard to recruitment of study participants and the laboratory technicians of the HCB Reference Laboratory in Beira for their support and advice concerning local laboratory study logistics. We are indebted to the analysts of the microbiology laboratory of the Academic Medical Centre of the University of Amsterdam for the training and support of SB. JCB, CS and JMP conceived of the study and designed it. JCB, SB, GM, ESG, EC, CM and JMP designed the study protocol. SB, GM and JCB carried out the study participant recruitment and screening. SB performed all microbiological analyses, under supervision of EC, JCB and CS. RS reviewed all CXRs. JCB and SB analysed the data and JCB, CS and JMP carried out the interpretation of the data. JCB drafted the manuscript. CS, RS and JMP critically revised the manuscript for intellectual content. All authors read and approved the final manuscript.